Network security and support should be one of the highest priorities for any organization, even small businesses. Technology drives most day-to-day business operations, and a company's computer network is an asset that need proper support, ongoing monitoring, and a high-level of security. Below we delve into why all small businesses need some level of network security and support to help protect their company's digital assets. A network is a large system of interconnected computers. The whole point of a network is to make it possible for people to access remote areas without physically having to be present there. Even for smaller networks, it is very important that important information be kept safe from any outside agents. This is where computer network security comes into play. It is an essential tool to protect your company’s information and data. Why Do Small Businesses Need Network Security? In today’s digital age, the threat from hackers and cyber criminals is a pressing concern. It is the duty of small organizations to ensure that the data of their employees and clients are protected in the best possible manner. In fact there are a number of laws that make it compulsory for businesses to have adequate network security measures. Most businesses have financial and personal information of clients and employees. Hence it is vital that a good security system be in place, at least one with basic firewalls and anti-virus protection. 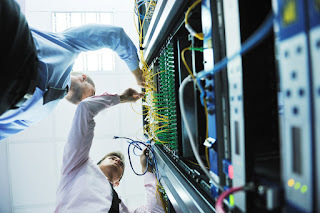 Consulting with a professional computer network security company is a good way determine your needs and get a sound protocol established. What are the problems that can arise from inadequate network security? a. Confidentiality Breach: There is definitely certain information that a company would like to keep out of their competitor’s reach. Improper security makes it easier for criminals to access this. b. Data Destruction: Sometimes important data could be destroyed and this can have repercussions on your company’s operations. c. Data Manipulation: It will be possible for hackers to manipulate data without you even realizing that anything has been changed. d. Phishing: Many hackers will use phishing techniques to gather personal information about your employees and clients. This can enable them to break into their bank accounts or use their credit card numbers. There are many measures that can be taken to improve your company security. Strong passwords and reliable anti-virus software are an absolute must. It would also be good to enable firewalls to enhance security. Make sure that mail attachments are opened only when there is a reliable source. The business network and IT support team should periodically monitor access to networks, memory sticks and other plug-in devices. a. Secure: Make sure all your data is protected with adequate authentication. b. Examine: Constantly monitor these safeguards to ensure that there is no breach. c. Test: Keep random tests to gauge the vulnerability of your system. d. Enhance: Take the necessary action whenever there is a need to improve security. Another important feature is to have a support system in place if there are any security breaches. After all you need to be in control, even if your system responds in a peculiar way that you cannot quite understand. Having adequate support ensures that you can handle any situation in the best possible manner.